Leonas celebrated 2018 title beating Jass Femenino in both games. Leonas posted a 56-50 win in the opener as Kathia Contreras top-scored for the winners with 21 points and Esperanza Orozco (82) brought 18. Joycee Gaitan (03) answered with 11 points in the losing effort. In game 2 Leonas celebrated a 45-44 victory. Tisha Slate (93) top-scored for the winners with 12 points, whilst Esperanza Orozco poured in 9. Mercedes Trana (83) replied with 12 points and 21 rebounds in defeat. Leonas and Jass Femenino reached the Final beating their opponents in the semifinal clashes. Leonas edged Tipitapa 56-41 as Kathia Contreras top-scored for the winners with 16 points. Julia Gomez netted 11 and Mariela Kittler nailed 10. Brittany Arellano replied with 21 points in a loss. Jass Femenino meanwhile overcame San Isidro 47-40. Ana Quintana stepped up with 11 points and Arlen Reyes brought 10. Maria Beltran ended up with 10 points in defeat and Ana Moncada produced 8. Mariela Kittler had 9. Arlen Reyes and Shriley Morgan replied with 7 points each in the losing effort. 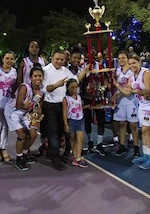 Jass Femenino is second in the League with an 8-1 record.